So the bees have been weird lately. 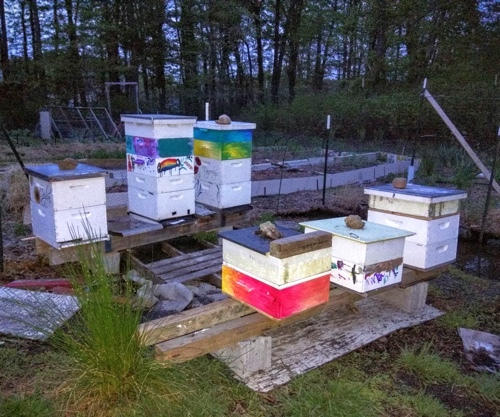 First, despite my best efforts (checkerboarding the brood frames, adding on multiple supers which they persist in completely ignoring) both Darjeeling and Lady Grey swarmed. In fact Lady Grey produced two swarms. 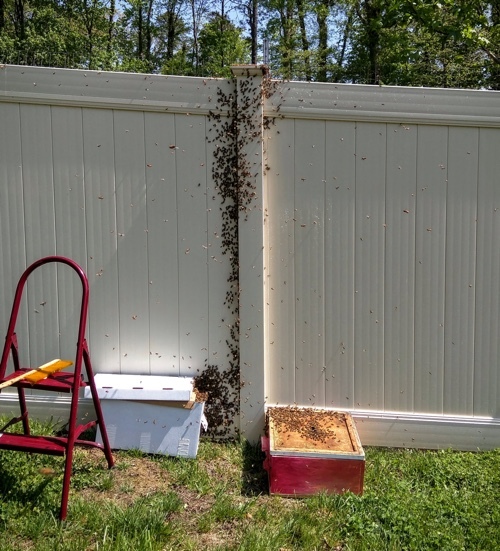 Which both obligingly rested side by side on a smooth vinyl fence and made for the very easiest bee capture ever. Five minutes, tops. For a couple days they both looked like they were contentedly humming away side by side with Darjeeling’s new swarm. For a fleeting moment I had six colonies and was feeling like an actual beekeeper. But then one morning out of the blue the new middle colony just up and vanished after drawing a few frames of comb. With sugar syrup in top feeder and everything – I guess they just decided they didn’t like their new digs after all. 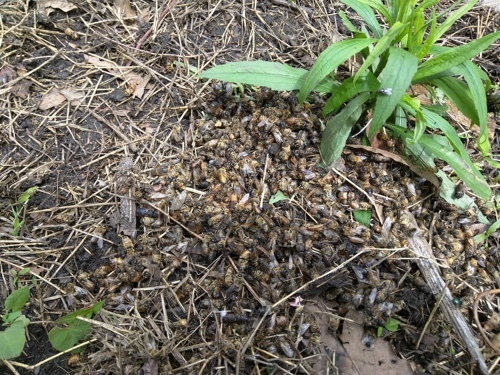 An enormous pile of dead bee bodies. Some still underdeveloped. Nearly all of them drones (I think). The colony seems fine, from what I can tell, so … your guess is as good as mine. And now the other swarm looks just pathetically diminished as well. Like, so diminished that I’m thinking of just consolidating it with another hive. Which would leave me with four colonies, two of which are fairly limping at the moment and which I should probably combine. So make it three… right back to where I was before. But with less actual bees, and no honey harvest. Damnit, bees. I tried so hard. This entry was posted on Saturday, May 21st, 2016 at 12:55 pm	and is filed under garden & farm, bees. You can follow any responses to this entry through the RSS 2.0 feed. You can leave a response, or trackback from your own site. Atom, Entries (RSS .92), (RSS 2.0) and Comments (RSS 2.0). 26 queries. 0.257 seconds. Top.